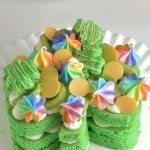 Green Shamrock Cake with adorable rainbow meringue kisses is perfect for celebration of the Saint Patrick’s Day. 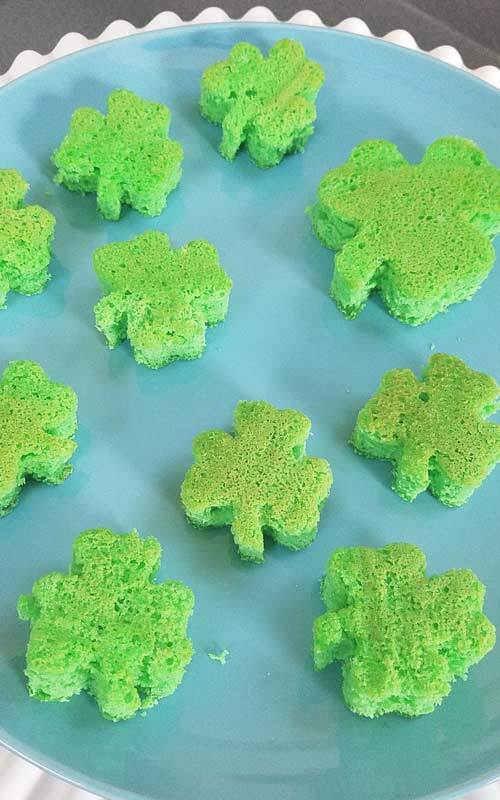 I grew up on sponge cakes and this is my usual choice when I make a cake but you can make this Shamrock cake with a pound cake, yellow cake, white cake. It’s your choice. I like sponge cakes because they are light and airy and go really well with my whipped cream filling. If you prefer cream cheese filling you can try my Chocolate Mint Stracciatella Cream Cheese Filling. To cut out shamrock shapes I made myself a paper template. Size of the shamrock is determined by the baking pan you will use. 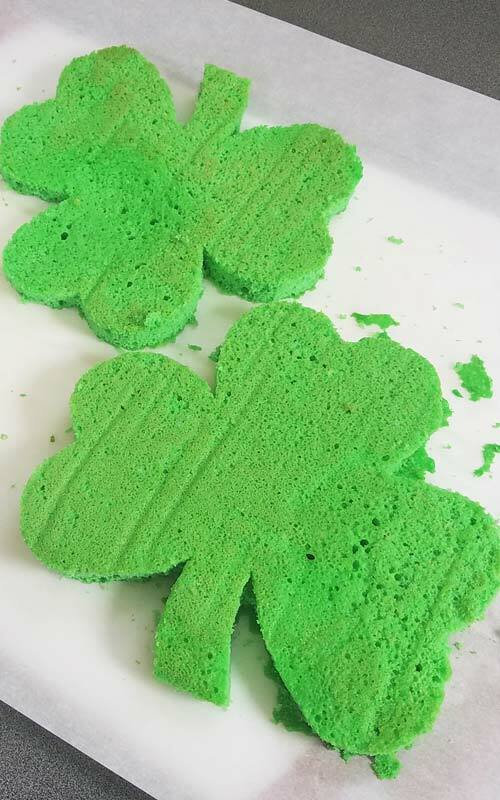 I used a half sheet cake pan and was able to cut out 3 large shamrock cake layers. Use a serrated knife to cut through the cake layers..
After I cut 3 large shamrock cake layers there was still some usable cake left. I decided to cut out small shamrocks with a cookie cutter. 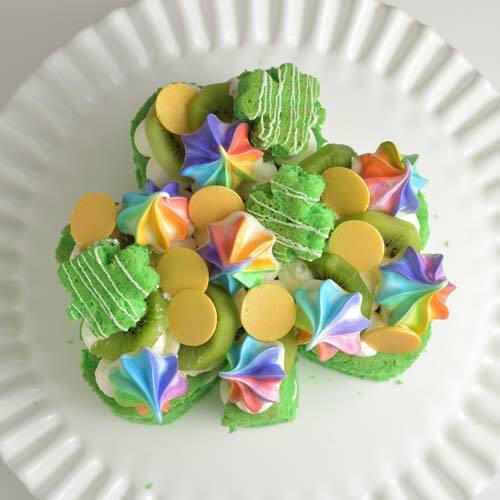 I used the same cutter to make these Shamrock Cookies. Rest of the cake scraps you can either freeze and have them at later time with yogurt, ice cream, jam or chocolate syrup. Meringues are one of my favorite treats to make. To make rainbow meringue kisses I took about 2 cups of whipped meringue and divided into 6 portions. Then each portion I quickly colored with food coloring : red, orange, yellow, green, blue and purple. Then I fitted a large piping bag with a Star Piping Tip. Trick is it spread each colored meringue on the inside of the piping bag in long strips next to each other. Then fill the hollow center with the white meringue. 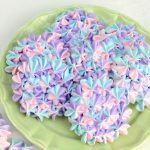 I piped rainbow meringue kisses onto a baking sheet lined with parchment. I like to bake meringues kisses at low temperature (175F) for 3 hours. After, I leave them in the oven to cool completely. Alternatively, you can use a plastic wrap method, too. Spread each color of meringue onto a plastic wrap next to each other. Then fill a bag with remaining white meringue and pipe it lengthwise in the center, leaving enough room on the sides so you can wrap the colored strips around the white meringue, keeping the white meringue in the middle. To make sure that meringue cookies don’t become soggy the minute they touch the whipped cream filling I treated them with chocolate. I dipped the bottoms of meringues in white chocolate. I used Ghirardelli White Chocolate Wafers. This whipped cream filling is wonderful. 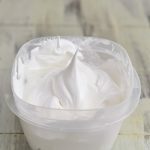 Into the whipped cream I like to fold in Greek yogurt or sour cream. It pairs really nicely with fresh fruit. Preheat oven to 350F. Prepare baking pan, line it with parchment and spray with a non stick spray, or brush with butter. Sift together flour, salt and baking powder, set aside. 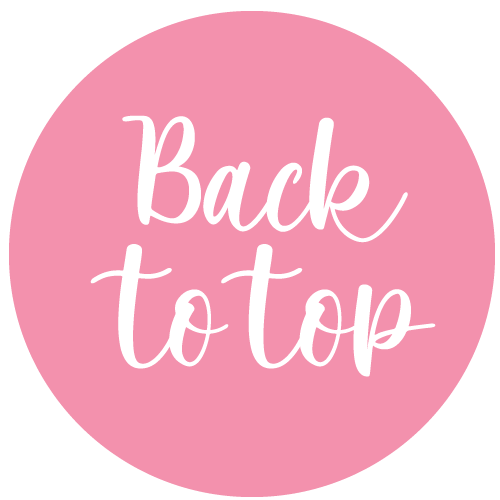 Beat egg whites on high until soft peaks are formed, gradually add about half of the sugar beat until stiff peaks are formed. Scrape the meringue into a clean bowl. Into the bowl you just whipped the meringue(no need to wipe it clean) add all the egg yolks and remaining sugar. Beat on high until pale in color, thick and forms a ribbon, scrapping the bowl few times. Gradually beat in oil, and then pour in slowly hot water and beat in vanilla extract. Lastly add green food coloring. Mix well until thoroughly combined. Gradually fold sifted flour and meringue into egg yolk mixture. Pour into a prepared pan, spread with a long spatula. Bake at 350F, 20-30 minutes, or until toothpick inserted in the center comes out clean. Invert the cake onto a clean work surface lined with a wax paper and cool completely. Whisk together gelatin and cold water. Set aside for 5 minutes. Mircowave on high for 5 second, until gelatin is dissolved. Let cool to room temperature. 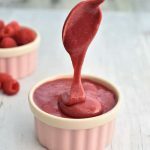 Beat whipping cream on high until soft peaks are formed add powdered sugar and gradually pour in gelatin beating on high, beat in vanilla extract. Gradually fold in sour cream. Fill the piping bag fitted with a large round piping tip with whipped cream filling and fill the cake. 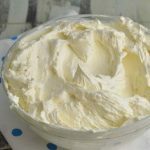 In a bowl of your mixer whisk together egg whites, sugar, and cream of tartar. Place the bowl over a pot with simmering water. 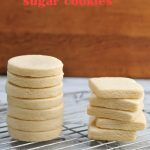 Stir constantly, until all of the sugar is dissolved and mixture becomes hot to the tough. Remove from the heat and beat on high with a wire beater until stiff peaks are formed, beat in vanilla. Remove about 2 cups of meringue, and divide into 6 portions. Color each portion with different color of a rainbow. Red, orange, yellow, green, blue and purple. Fit a large piping bag with a large closed star piping tip. Spread colored meringue onto the inside wall of a large piping bag. Keeping the center hollow/empty. 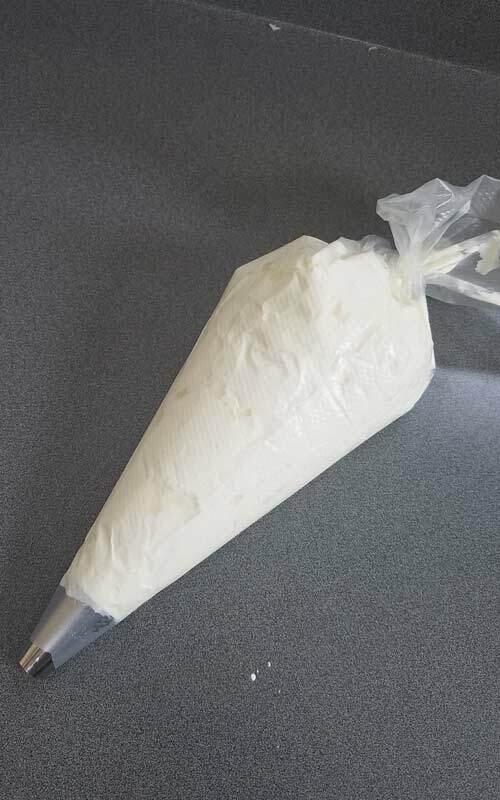 Fill a large piping bag with a remaining white meringue and carefully fill the hollow section with the white meringue. Pipe kisses/stars onto a baking sheet lined with a parchment paper. Bake at 175F, for 3 hours, turn off the oven and let cool in the oven. 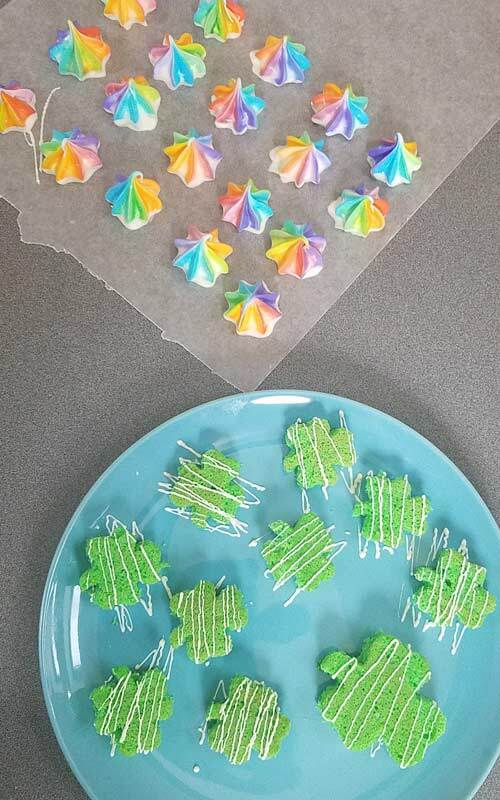 Melt the chocolate wafers and dip the bottoms of each meringue kiss in the chocolate, Place each rainbow kiss on a wax paper, let the chocolate harden. Remove from the wax paper. Store in an airtight container with a small bowl or raw rice or food grade silica gel. This helps to keep the moisture from attacking meringue cookies. Peel kiwifruit, cut into halves. To make the coins spray yellow chocolate wafers with Gold Mist. 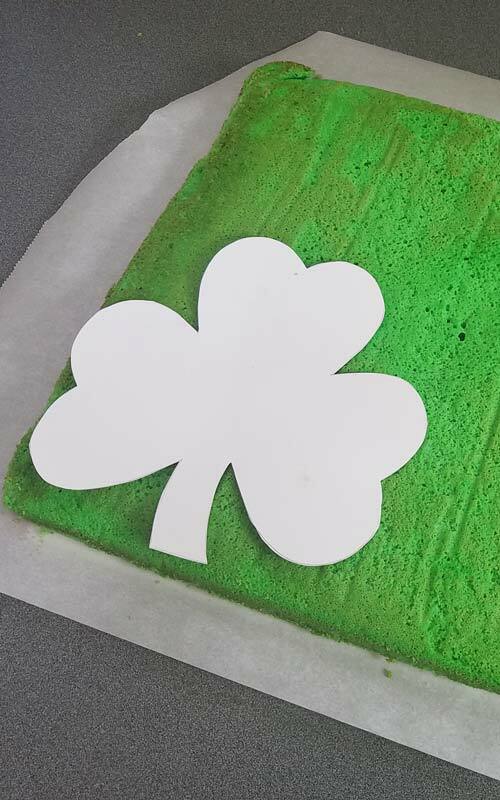 Using a shamrock template cut out 3 cake layers. 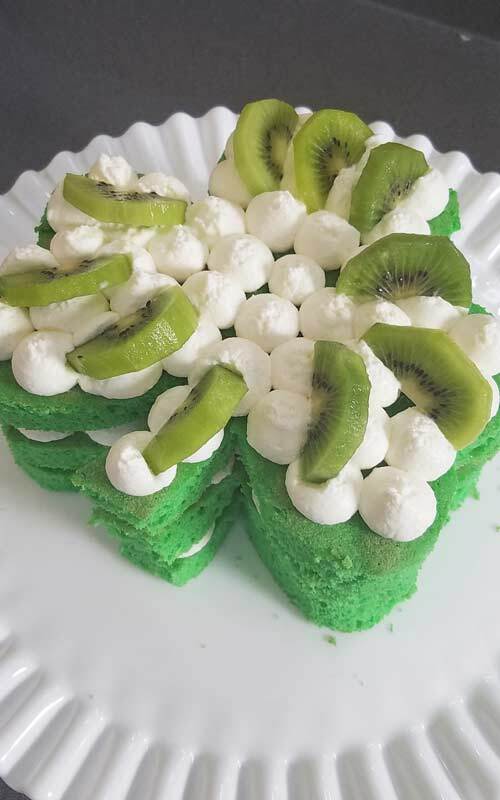 Pipe the whipped cream filling onto the cake layer, layer kiwi fruit onto the whipped cream filling, repeat with 2 remaining cake layers. Cake like this can be covered and stored in the fridge for up to 3 days. 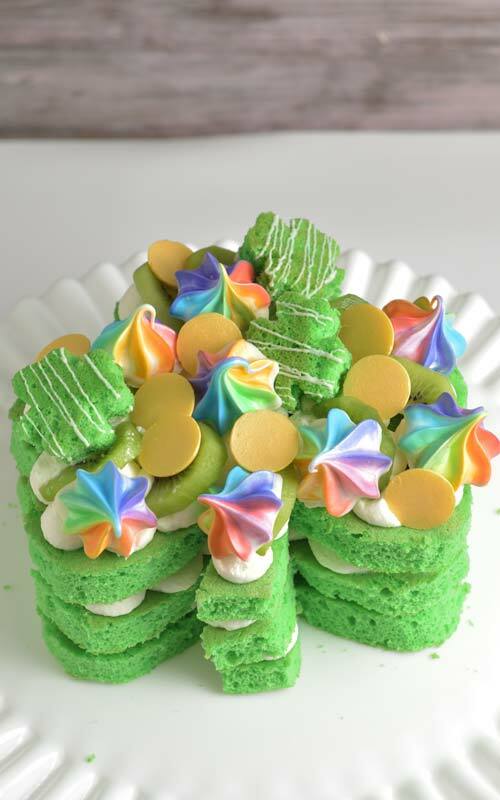 Decorate the top cake layer with rainbow meringues and chocolate coins.